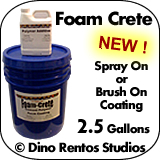 2.5 Gallon Foam Crete - Foam Coating - Dino Rentos Studios, INC. Foam Coating for art sculptures and architectural shapes. Brushable and Sprayable: See our Spray Hopper Gun. Comes as a powder kit. Mix with water and included polymer. You must use what you mix (just like any other multi-componet mix coating). Spray goes on smooth. Brush leaves a brush texture. Coating is very hard. For professional results, spraying is recommended. Call for quantity discount on shipping and product.